The graph below shows the prevalence of bovine TB in badgers found by carrying out postmortems on road kill. The data plotted in this graph were calculated from the number of badgers diagnosed positive and negative. These numbers are shown in the legends of the following Road Traffic Accident maps. It should be noted that statistical confidence due to small sample size is lowest for the year 2000. Detection of disease in post-mortems is not an exact science and there is a tendency to underestimate true levels. For example, Reference 4 states that during the Random Badger Culling Trial (RBCT) it was recognised that in interpreting patterns of TB prevalence in badgers, the standard diagnostic methods used were not 100% sensitive and so would provide an underestimate of the number of infected badgers. In fact, the sensitivity of the standard post-mortem examination protocol was compared with that of a detailed protocol in Reference 8. In this study, a sample of 205 post mortem examinations conducted under lesser time constraints than was possible for the majority of RBCT badgers revealed substantially more infected animals than did standard post mortem examinations of the same animals. In fact the sensitivity of the standard post mortem protocol was estimated to be 54.6% (95% CI 44.9% - 69.8%)8. Hence detected levels of disease in badgers analysed during the RBCT appear to have under-estimated actual levels by about a half. The following graph shows the prevalence of bovine TB in cattle. This prevalence was calculated by dividing the total number of reactors taken from county animal statistics by the total number of cattle and calves taken from census tables. This data is contained in an archive which can be downloaded by clicking here. It is widely reported that the prevalence of TB in badgers and cattle is closely related and this is borne out in the above graphs in so far as the prevalence in the northern counties in both species is greater than in the southern counties. Indeed, in November 2012 direct genetic evidence of M. bovis persistence on farms over multiple outbreaks with a continued, ongoing interaction with local badgers was reported26. However, it was also reported that directionality of transmission could not be inferred at that stage. In 2011 the Republic of Ireland tested the hypothesis that cattle could be used as sentinels for infection in the badger population28. The prevalence of TB in badgers retrieved from road traffic accidents is shown in the thumbnail below. TB in badgers appears to be a maximum in Gloucestershire. TB in cattle is also a maximum in Gloucestershire. Foot and Mouth occurred in 2001 during which time testing5 was substantially reduced during 11 months. When the Foot and Mouth movement restrictions started to be lifted in the second half of 2001 this resulted in a large number of untested cattle being moved to different parts of the country during the restocking process. This resulted in increased cattle-to-cattle transmission and the peak in the prevalence of TB in badgers in the northern counties in 2002 suggests that significant transmission from cattle to badgers may have occurred on top of any badger-to-badger perturbation effect. Regarding badger-to-cattle transmission, this is widely recognised and this has been reported in DEFRA-supported work by Zuckerman1 (1980), Dunnet2 (1986), Krebs3 (1997) and Bourne4 (2007). Christl Donnelly in March 2010 submitted a report10 which stated that based on a subset of data taken from the RBCT, results indicate that TB in cattle herds could be substantially reduced, possibly even eliminated, in the absence of transmission from badgers to cattle. Christl Donnelly was deputy chair of the Independent Scientific Group on Cattle TB (1998 to 2007), through which she was jointly responsible for the design and analysis of the RBCT11. The absence of TB in cattle herds 10 years after the Thornbury trial supports this view. Many farmers may be under-estimating the extent to which badgers are visiting their buildings at night. In 2011 work carried out by The Food and Environment Research Agency on farms in Gloucestershire reported21 the following.
" Intensive surveillance over a full year demonstrated that badgers visited buildings at least occasionally on 19 of 32 (59%) farms in our sample. On 3 of the 32 farms (approximately 1 in 10), visits were very frequent, occurring on more than 60% of nights. Badgers visited feed stores and cattle housing, with visits to feed stores being more frequent. While badger visits to farmyards occurred all year round, they peaked in late spring/early summer. " Transmission from badgers to cattle may be principally due to direct respiratory transmission and preventing this is more practical in farm buildings than at pasture. Reference 22 in 2011 reported the following.
" Two potential routes of transmission are identified: (a) direct aerosol / respiratory transmission, which may occur when there is close (2-3m) contact and (b) indirect transmission through cattle contact with potentially infectious badger excreta such as sputum, pus, faeces or urine. Previously, direct (or close) contact between the two species was considered to be rare. Therefore, indirect transmission was perceived to pose the greater risk. However, TB is primarily a respiratory infection spread by the aerosolisation and inhalation of bacilli from infectious cases. Recent ecological studies in GB, involving CCTV and proximity logging transponders, revealed that direct badger-cattle contact occurred more frequently than was previously suspected. Whilst there is no firm field evidence, the combination of knowledge of TB pathology in the two species and ecological studies in relation to badger-cattle contacts suggest that direct respiratory transmission is likely to be main route of infection. Preventing direct contact at pasture is accepted as being particularly difficult. " Direct transmission from badgers to cattle appears to happen more often in buildings than at pasture. In 2012 a researcher at The Food and Environment Research Agency reported23 the following.
" We also found that videos recorded as part of the PhD projects showed that badgers and cattle were coming into very close, almost nose-to-nose, contact with each other in farm buildings. However research done in the pasture environment - for which the animals wore radio contact collars that registered when they came within a certain distance of each other - showed that it was quite rare for a badger and a cow to come into close enough contact for us to think that transmission could occur. So, potentially, there may be more of a risk of transmission in buildings than in pasture, although there will obviously be more urine, faeces, and so on, in the pasture. " Transmission from badgers to cattle may principally be due to a subset of infected badgers which have reached a late stage in the infection. In 2000 J.Gallagher and R.S. Clifton-Hadley wrote a report24 which concluded as follows.
" Others succumb to florid disease and whilst those with lesser lesions may merely act to maintain infection amongst the badger population, it is probably the smaller number with advanced disease, that result in overspill from this reservoir of infection, to infect cattle and to a lesser extent other species. " However the RBCT Final report (Ref 4) notes the very small number of severely lesioned badgers found during the RBCT and states that animals with only mild (or no detectable) pathology may be able to transmit infection as had been demonstrated recently in cattle in work reported by McCorry et al in 2005. Regarding more severely infected badgers, badgers weakened by infection may spend a large proportion of their time foraging for food in farm buildings where access to food is easier as reported in Reference 25 as follows.
" Intensive nocturnal field observations revealed that infected badgers might be more likely to enter buildings than their uninfected counterparts (Garnett et al. 2002). This greater dependence on anthropogenic food sources may be a consequence of nutritional stresses imposed by the infection. " In	the	past,	Defra	has	advised	farmers	to	fence	cattle	away	from	badger	setts	and latrines,	which	are	associated	with	relatively	high	densities	of	badger	excreta	and	might therefore	be	high	risk	sites	for	cattle	to	become	infected. Unfortunately,	badger	latrines are	not	fixed	in	space. Indeed,	badgers	prefer	to	place	latrines	close	to	fences	(Delahay	et al.,	2007),	so	it	is	quite	conceivable	that	fencing	around	a	latrine	could	simply	cause	the badgers	to	shift	the	latrine	to	both	sides	of	the	fence. Physically	removing	latrines	does	not prevent	badgers	from	continuing	to	defecate	at	the	same	sites	(King,	1997). Unfortunately cattle interaction with moribund badgers at pasture may be a significant route of transmission and has potential to result in many cattle being infected in a short space of time as a study carried out in New Zealand in the early 1990's suggests. This study looked at the behaviour of 17 steers at pasture when sedated possums were released onto the pasture.30,31 It would be impractical to implement bio-security to stop such interaction. Spoligotyping is a very simple, inexpensive and effective tool for TB research. It is a PCR-Based method to detect and type TB bacteria in clinical samples. The following maps6 show the spoligotypes identified in reactor cattle in 2000 and 2005. Dispersal of different spoligotypes to remote locations is thought to be due to cattle to cattle transmission. However it is a concern that wildlife sanctuaries are releasing a small number of badgers each year to new locations. Also a large number of traps went missing during the Random Badger Culling Trials and these traps may have contained badgers which were relocated to areas outside the culling zones. In fact, between December 1998 and 10 October 2003, 1827 cages were removed9. Culling during these trials started in 1998 and ended in October 2005. Compared to cattle, badgers are relatively non-mobile and this will be influencing the dynamics of the spread and the way in which strain types are clustered. In Reference 27, Professor Ian Boyd commented that cattle movement controls to prevent the spread of bTB are working, as otherwise we would probably have a lot more mingling of bTB strains and an eventual blurring of regional distinctions. After Foot and Mouth, bovine TB spoligotypes largely confined to the South West appeared in counties such as Cumbria as can be seen in the maps shown above. As stated above, this is likely to have been due to the large number of untested cattle being moved to different parts of the country during the restocking process and the associated increase in cattle-to-cattle transmission. 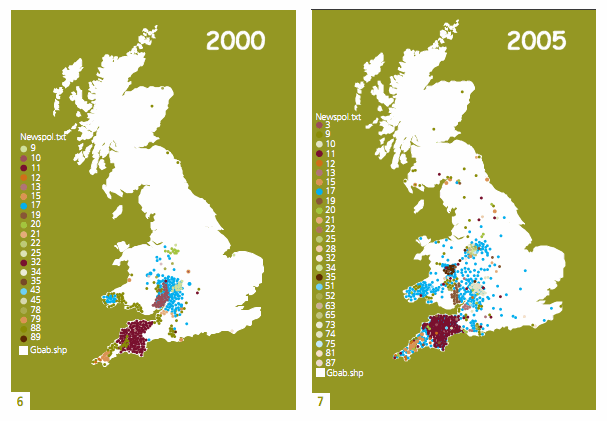 The location and distribution of confirmed cases of Foot and Mouth in Great Britain in 2001 are shown in the map below. 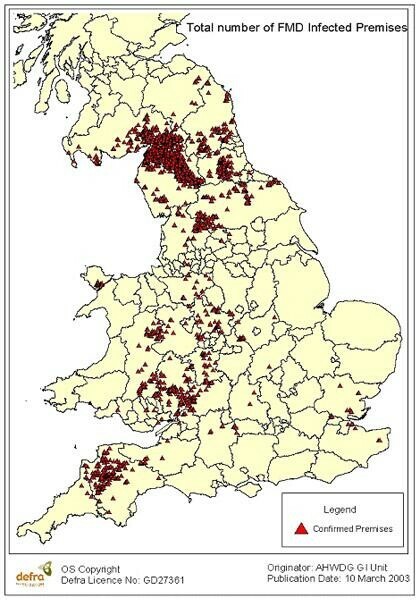 The following map of Great Britain shows the location and distribution of bovine TB confirmed herd incidences from June 2010 to June 201129. Notice the sparsity of cases in Cumbria. Shown below are graphs which shows the impact of this restocking on bovine TB in Devon and Cumbria and what has been happening in subsequent years. Cumbria was by far the worst affected county where Reference 14 reports that 209,106 cattle were slaughtered due to Foot and Mouth. In fact in 2001 cattle number were 53% of what they were in 2000. Devon was the second most affected county where 67,677 cattle were slaughtered. As such in 2001 cattle number in Devon were 88% of what they were in 2000. In the above graphs cattle numbers were extracted from Reference 12 and the number of cattle slaughtered due to TB were taken from the total number of reactors given in Reference 13. As can be seen in Reference 5 the test interval in much of Devon in the year 2000 was either 2 or 3 years. Also in Cumbria the test interval was 4 years throughout the county. Hence disclosure of the extent to which infection had increased due to restocking and movement of diseased cattle did not become fully apparent until 2004 in Cumbria. Although there was no relaxation of bovine TB restrictions to allow restocking as outlined in the DEFRA email shown in Reference 16, it was not until November 2004 that many cattle-based measures were introduced in England to tighten surveillance and reduce the risk of bovine TB spreading to new areas. In addition to this, as current in March 2012, most of Cumbria remains as 4-year testing parishes as can be seen in the map in Reference 17. Unlike Devon where TB incidence has continued to rise after 2004, in Cumbria levels started to recover to what they were before Foot and Mouth. The good recovery in Cumbria with its less frequent cattle-testing regime and the worsening situation in Devon with its more frequent testing regime is a good indication that the worsening situation in Devon is not principally due to the cattle-to-cattle transmission element. Given that TB is concentrated in the South West and Wales and spreading outwards from these regions, practical experience does not support the assertion that the rising incidence of disease can be reversed by the rigid application of cattle-based control measures alone. This interpretation of the scientific findings was given by F J Bourne in his covering letter dated 18 June 2007 when submitting the Final Report4 of the Randomised Badger Culling Trials. Another piece of evidence which does not support this assertion is the absence of any confirmed case of herd breakdowns for 10 years after the Thornbury exercise in Gloucestershire. One of the reasons why the Thornbury area was chosen for the exercise was because it was an area known for relatively high and persistent levels of TB where cattle-based control measures were failing. Returning to Cumbria, levels do not appear to have totally recovered in Cumbria up to 2010. It is possible that pockets of resistance may be due to infection becoming established in wildlife which were not infected prior to Foot and Mouth. However this is not revealed by current levels of TB in Cumbria. In fact between 2008 and August 2013 these levels were about the lowest relative to levels in all other counties in England. In 2006 the European Commission issued a guidance report15 which states the following. "It has now been reliably demonstrated that the persistence of an infected wildlife reservoir that enters into contact with cattle is a major obstacle to the eradication of TB. This obstacle should be addressed in tandem with the measures implemented in relation to the cattle population. While future prospects for the development of suitable TB vaccines for use in wildlife are promising, considerable obstacles remain which make it difficult to foresee the use of such vaccination on its own as the most suitable tool to use to address the persistence of the variety of infected wildlife reservoirs worldwide in the near future. In the meantime, therefore, alternatives to vaccination, in order to address the role of infected wildlife in the persistence of TB should be implemented without any delay so as to allow the progress of the eradication programmes. The elimination or reduction of the risk posed by an infected wildlife reservoir enables the other measures contained in the programme to yield the expected results, whereas the persistence of TB in these wildlife populations impedes the effective elimination of the disease." Badgers, Cattle and Tuberculosis. Zuckerman O.M. MINISTRY OF AGRICULTURE, FISIIERIES AND FOOD. August 1980. BADGERS AND BOVINE TUBERCULOSIS - REVIEW OF POLICY. MINISTRY OF AGRICULTURE, FISHERIES AND FOOD. G M Dunnet, D M Jones, J P Mclnerney. March 1986. Comparison of a standard and a detailed postmortem protocol for detecting Mycobacterium bovis in badgers. Cattle numbers by county in England from 2004 to 2012 supplied by the Rural Payments Agency. Cattle numbers by county in Wales from 1998 to 2010 supplied by the Welsh Government. Cattle numbers by county in Scotland from 1998 to 2010 supplied by the Scottish Government. Effectiveness of Biosecurity Measures in Preventing Badger Visits to Farm Buildings. Johanna Judge, Robbie A. McDonald, Neil Walker, Richard J. Delahay. 2011. Bovine TB: a review of badger-to-cattle transmission. Adrian R. Allen, Robin A. Skuce, Stanley W. J. McDowell. 31 March 2011. Bovine TB Review: Food and Environment Research Agency. Dr Johanna Judge. 12 June 2012. An investigation of potential badger/cattle interactions including the extent of badger visitations to farm buildings and food stores, and how cattle husbandry methods may limit these. Whole Genome Sequencing Reveals Local Transmission Patterns of Mycobacterium bovis in Sympatric Cattle and Badger Populations. Roman Biek et al. PLOS Pathogens | www.plospathogens.org. Published November 29, 2012. Tackling Bovine TB - The story of bovine TB - The attack of the clones. By Professor Ian Boyd, Defra Chief Scientist. 3 Apr 2013. Tuberculosis in cattle herds are sentinels for Mycobacterium bovis infection in European badgers (Meles meles): the Irish Greenfield Study. Vet Microbiol. 2011 Jul 5;151(1-2):120-5. Veterinary Science Centre, School of Agriculture, Food Science & Veterinary Medicine, University College Dublin. D Murphy et al. 5th July 2011. Geographical distribution of new OTFW incidents between July 2010 and June 2011. Taken from a report titled "Geographical distribution of new OTFW incidents between July 2010 and June 2011" commissioned by Defra, the Welsh Government and the Scottish Government under Project SB4500. Interactions between beef cattle and simulated tuberculous possums on pasture. Paterson BM , Morris RS. N Z Vet J. 1995 Dec;43(7):289-93. BEHAVIOURAL PATTERNS OF POSSUMS AND CATTLE WHICH MAY FACILITATE THE TRANSMISSION OF TUBERCULOSIS. Thesis for Master in Veterinary Science at Massey University. Brent Maynard Paterson. 1993.